Mention "Freshkills" to any New Yorker and the reaction you'll most likely get is "P.U." The name has long been associated with the world's largest landfill, and has made life for many Staten Islanders (where the dump is located), well, stink. But what many people aren't yet aware of is that the long suffering of those folks is soon to be rewarded because a monumental new green space is being developed on the site of the old landfill, which received its last barge of garbage on March 22, 2001, and from what we've seen, it's incredible. At 2,200 acres, Freshkills Park is set to be almost three times the size of Central Park and will be the largest park developed in New York City in over 100 years. That's right, what was the world's biggest collection of garbage is being transformed into a beautiful green space for New Yorkers to hike, play and even ski - and with numerous sustainable strategies already in the works, it's also promising to be one of the most eco-friendly developments in the city. Sure, we all love Central Park, but Freshkills Park is set to eclipse it in both size and the wide range of recreational opportunities that will be available (check out the slideshow above to see what some of them will be). The park will also offer ecological restoration and cultural and educational programming, including possible demonstrations teaching the public about renewable energy, that will echo its environmental mission. About 45 percent of the planned park site was once used for landfill operations, but the remainder of the land is currently composed of wetlands, open waterways, and unfilled lowland areas. The full transformation and build-out will continue over the next 30 years, with phases over the next few years focusing on providing the public with the opportunity to see the interior of the site, which will be a unique combination of natural and engineered beauty. One of the coolest examples of what people will be able to experience is standing atop the landfill mounds themselves to check out a breathtaking view of lower Manhattan. 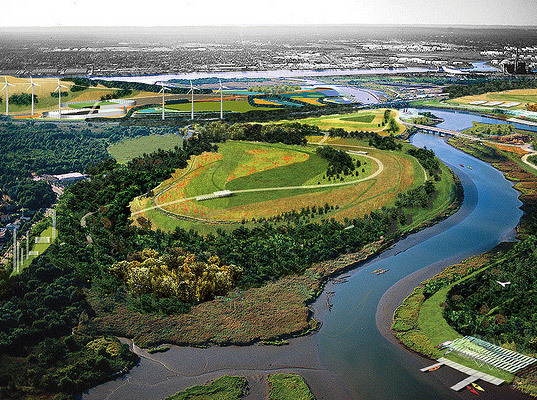 Freshkills will also be a showcase for sustainable strategies, some of which are already in place. The NYC Department of Sanitation is already using advanced landfill gas collection infrastructure throughout the landfill to actively harvest methane from the buried decomposing waste. The methane is sold to National Grid to heat close to 22,000 homes on Staten Island and the city generates approximately $11 million in annual revenue from the sale of the methane. In addition to turning farts to fuel, some of the other strategies the city is considering for the park are solar panels, wind turbines, solar thermal cells in water heating systems, geothermal heating and cooling, and following LEED building principles. A brief history of Freshkills Landfill: Fresh Kills Landfill was established in 1948, before there was any large–scale development in the area. Over the years, it became the largest landfill in the world, amassing most of the household garbage collected in New York City. To give you an idea about how much trash was coming into the dump, at its peak, Fresh Kills received as much as 29,000 tons of trash per day and the four landfills mounds on the site are made up of approximately 150 million tons of solid waste. By 1997, two of the four landfill mounds were closed off and covered with an impermeable cap. Freshkills received its last barge of garbage on March 22, 2001. New York City’s garbage is now shipped to landfill locations in places such as Pennsylvania and Virginia. Youve got it in one. Culodnt have put it better. Many areas of the former landfill are already looking like a verdant park and have been visited by curious New Yorkers. The new park will have numerous picturesque bike and pedestrian paths. What the park looked like this winter with a blanket of snow on top. What's this?! From the renderings, it looks like people will be able to cross-country ski - something that most New Yorkers have to leave the city to do. Freshkills Park gets some visitors from the Staten Island Zoo. What the park looked like in the fall. What landfill? The entrance to the North Park will be accentuated by a signature Photovoltaic Shade Structure, which will provide shade to park guests seated on benches at the entrance in addition to powering the lights in the parking lot. An artpiece reminding parkgoers about the park's past. A view of the on-premises seed farm with the picnic lawn in the distance. Sure, we all love Central Park, but Freshkills Park is set to eclipse it in both size and the wide range of recreational opportunities that will be available. 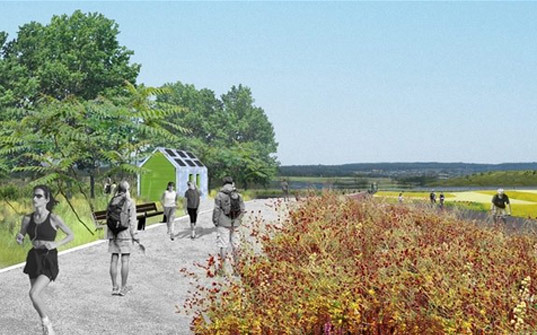 The park will also offer ecological restoration and cultural and educational programming, including possible demonstrations teaching the public about renewable energy, that will echo its environmental mission. About 45 percent of the planned park site was once used for landfill operations, but the remainder of the land is currently composed of wetlands, open waterways, and unfilled lowland areas. The full transformation and build-out will continue over the next 30 years, with phases over the next few years focusing on providing the public with the opportunity to see the interior of the site, which will be a unique combination of natural and engineered beauty. One of the coolest examples of what people will be able to experience is standing atop the landfill mounds themselves to check out a breathtaking view of lower Manhattan. Freshkills will also be a showcase for sustainable strategies, some of which are already in place. The NYC Department of Sanitation is already using advanced landfill gas collection infrastructure throughout the landfill to actively harvest methane from the buried decomposing waste. The methane is sold to National Grid to heat close to 22,000 homes on Staten Island and the city generates approximately $11 million in annual revenue from the sale of the methane. In addition to turning farts to fuel, some of the other strategies the city is considering for the park are solar panels, wind turbines, solar thermal cells in water heating systems, geothermal heating and cooling, and following LEED building principles.